So here is week 4 of what I've been reading! The Hidden Flame, by Davis Bunn and Janette Oke. This is the second book in the Acts of Faith series. I read the first one, The Centurion's Wife, a couple weeks ago. This is a fictional story set in the very earliest days of the Early Church, primarily in Jerusalem. Many of the characters from the first book are also a part of this story. Abigail, a minor character in the first book, is the primary character in this story. She has two very different suitors vying for her hand. All of this is set against the background of some dramatic Biblical events. What I really appreciate about this series, besides the fact that the male characters sound like real men, is how it makes me consider the stories from the Bible. How did the other believers respond to what happened to Ananias and Sapphira? Or when Peter was miraculously released from jail? The answers that Bunn and Oke provide to these questions are believable. I found this book faster moving than the first, and I found it easier to identify with the characters -- perhaps because I had gotten to know many of them in the first book. I would recommend starting with the first book in the series, as I think it would be tough to keep track of who is who if you started with this title. The Iliad: Connor has this assigned to him over four weeks, and I am reading along. Week 4. The good, the sick, and the ugly. The good: my water intake is up. I am drinking water daily. Lots more than I had been. All that encouragement from my fellow fit mamas helped!! I walked on Saturday. The sick and the ugly: I warned you last week. The houseful of sick kids are pretty much better. Connor & I got it Monday though. I pretty much slept Monday-Wednesday. And woke up to get some water. So I did not meet my exercise goals. Fortunately, I had written up my review posts last weekend, so things kind of went on auto-pilot on my blog. 3) I will check in every Friday, whether I met my goals or not. I will tell how I did, and I will adjust goals for the following week. How do I figure out the "supposed to's" in homeschooling? How do you know what to teach? is the subject of next week's Blog Cruise. This is not a question I've been asked very often, but it is a really good one to consider. The big thing to know is that there is not one single plan out there for what a 3rd grader is "supposed to" be studying. So who is to say whether what I'm doing is "right" or not? I think with a lot of prayer, some planning, and maybe a bit of checking other people's scopes and sequences, that the "supposed to's" for a particular child at a particular time can be found. But none of my four children have done the same thing in kindergarten (and Trina, my 3 year old, will undoubtedly be doing something very different from her brothers when she gets there too). They've all done reading, religion and 'rithmetic... some have done writing, they have done some type of history or science. But the specifics? Those have varied. A lot. One way you can be sure of what to teach is to go with an all-in-one type of a program. This is not something I've exactly done. But if you go with curriculum from places like Abeka or Veritas Press, even if you pick and choose a bit (3rd grade math? 2nd grade language arts? ), if you are getting the "right" level for your child from everything they offer, you can feel fairly confident you are teaching what you "should" be. Find one of a gazillion resources out there that give a scope and sequence. What Your Child Needs to Know When by Robin Sampson is a title I own. There are resources available online though too. I don't use them, so I don't know where to look -- I'd bet someone else on this blog cruise will link 'em though. Use a resource like the The Core Knowledge Series (link is to What Your First Grader Needs to Know), which goes from Preschool through 6th grade. You could use the book as a basis for creating your own lessons. Or, what I've done, is to teach what I want, and have one of these books in the van to use throughout the year to kill time. It helps me feel like I am covering all of the "supposed to's" this way. Or, the approach I've been closer to for elementary years anyway, just not worry a whole lot about it. I try to do a systematic math program, and learn to read, and we choose history and science and everything else based on what is available or what seems like the right thing at the time. High school is a bit different. Not that I feel like I need to mimic what the local public school does, but I do think it is a really good idea, sometime around 7th grade, to do some planning for high school. I reviewed a resource last fall that I think is perfect for this. It was by EDUDPS, called The Complete Career, College and High School Guide for Homeschoolers. This resource helped us to see what is generally expected for a college prep transcript, and to start mapping out how this particular 7th grader wants to get there. How do you know what to teach? Well, in my experience, I am never quite sure I am teaching what I'm supposed to. But I pray about it, and try to stay open to where God leads me. The TOS Crew Facebook Fan Page is sponsoring a Blog Cruise -- a question of the week -- every Tuesday. How Do You Know What to Teach? is planned for Feb. 2. I plan to participate as often as possible. 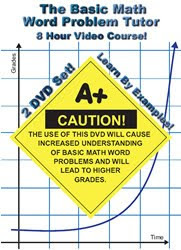 Math Tutor DVD has, you guessed it, math DVDs. Their products have focused on more advanced math, but they do now have products ranging from Preschool to Calculus 3, and also Physics. As part of the TOS Homeschool Review Crew, I received two products for review: Young Minds Numbers and Counting and The Basic Math Word Problem Tutor. The Young Minds DVD is one of their newest products, and it is meant to teach counting from 1-10. However, with the way it is set up, it does far more. There is classical music playing in the background, stunning photographs, and not only are they counting, but they are making a statement about each photo too. Other sections have you counting animals (and hearing animal sounds), or vehicles for transportation. The vocabulary used is fairly rich, the photos are beautiful, the music is wonderful. My 3 (almost 4) year old loves this DVD. My 5 (almost 6) year old enjoys it, but doesn't request it. Even my big guys will stop what they are doing to watch. This DVD is available for $19.99, and it will get plenty of use in my home. The DVD is broken into fifteen lessons of roughly a half hour each. The first four cover the four basic operations with whole numbers, the next four cover those operations with decimals, then four more with fractions. The final three lessons are on percents, ratios and proportion. The presentation is a bit dry -- the instructor standing in front of a white board, talking, or writing out the problems. But the content is excellent. We watched one lesson at a time, 2-3 lessons per week. My older guys could have gone a bit faster, but I wouldn't want to do more than one lesson per day. "I like it. It gets the point across, though it is a little dry." When I asked him if he would be interested in some of the other products that MathTutorDVD puts out, he definitely wanted to hear the list. He was impressed with the options, and told me that he thinks this would be a solid supplement to his upper level math, and that it would be really nice for his brothers to have available too. And he insisted on watching some of the samples (calculus in particular). My fifth grader is really enjoying the DVDs. He wants to be pausing the DVD so he can solve the problem first. This has been perfect for him. The math is easy enough to give him confidence, and to let him focus on the point of the lesson -- the concepts being discussed. My third grader loved the first half (whole numbers and decimals), but started to zone out in fractions. I lost him when they started covering multiplication of fractions. I will repeat this for him down the road. I think the first half was fantastic for him though. Check out the website, where you can see samples of these DVDs, and their other products too. I am very interested in their upper level courses, especially after just now getting Connor's take on them. While I think this is a terrific product for my family, it may not be a good fit for yours. I have children who tend to do pretty well with math. They don't need flashy presentations if they are ready for the material, and they are willing to sit through "dry" (you notice both Connor & I used that word) if they see value in what they are hearing. The samples, in my opinion, do a very good job of showing what the program is like, so I highly recommend watching those. Disclaimer: As part of the TOS Homeschool Review Crew, I did receive the two courses mentioned in the review for free from Math Tutor DVD. The fact that I received a complimentary product does not guarantee a favorable review. It does guarantee a review. A fair review. But I am not going to praise something unless I think it deserves the praise. If I don't like it, you'll hear that. And hopefully with enough detail as to why so you can decide for yourself if what I hate about it makes it perfect for your family. For more about my take on reviews, visit my blog post here. I had never heard of Zeezok Publishing, but when I saw that as a member of the Old Schoolhouse Review Crew, I would be receiving something from them, I had to go check them out. It turns out I had heard of their products. At least some of them -- the music products. They also have penmanship materials, and some other items too. I was thrilled when I found out that I'd be receiving their Brahms/Shubert special offer. This is what I received -- two books (The Young Brahms and Franz Schubert and His Merry Friends, two study guides to go along with those titles, and a Companion CD). We started off with the Brahms book (because I actually own some other Brahms music, and very little Schubert). This has been fantastic. The book is wonderful. At about 150 pages, it has made a terrific read-aloud. We have been working through it by reading a half chapter or so one day, the rest of the chapter the next, and going through the study guide on the third day. The companion CD includes 10 coloring pages, which I print up for my younger kids as we go. It also includes some "fun" pages (a symbol code thing, and a word search) that we are not using. The CD includes music tracks to go along with the book also. We are really enjoying this. I feel like my children are learning quite a bit about Brahms, and they are far more interested in listening to his music now that we have read his biography. The book captures the attention of all of my kids, which I really appreciate. We have not started the Schubert book yet, but will be doing that next week. From looking through the book, it is similar in style, and I'm positive we will enjoy it at least as much. If I were using this with just younger kids, I'm not sure that I would find the study guide to be of much value. I tend to lose my kindergartner and nearly 4 year old on our study guide days (which is why that is the day they get the coloring pages!) My 3rd, 5th and 7th graders, however, really enjoy the study guide. I am supplementing this with real recordings of Brahms' music. We are also listening to the Classics for Kids broadcasts about Brahms. We have listened to many of these in the past, but hadn't done the Brahms one. However, I think the materials by themselves would also make a great study. This package is available for $35.80 in softcover. Disclaimer: As part of the TOS Homeschool Review Crew, I did receive Brahms/Schubert package from Bookpeddler for free. The fact that I received a complimentary product does not guarantee a favorable review. It does guarantee a review. A fair review. But I am not going to praise something unless I think it deserves the praise. If I don't like it, you'll hear that. And hopefully with enough detail as to why so you can decide for yourself if what I hate about it makes it perfect for your family. For more about my take on reviews, visit my blog post here. We've been blessed with so many wonderful resources this year with the Crew, and Saxon provided my family with yet another one of those. I have to admit that I've never thought Saxon Math would be a good fit for my children, and as a result, I hadn't really looked at their online facts drill program, Facts First. That meant I was missing out. All that Facts First does is drill math facts... addition, subtraction, multiplication and division. My children can't go doing money, or time, or weights. The only thing they can work on in Facts First is drilling the math facts. And it is even fun. Basically, you start with one type of fact (let's take addition) and you begin by doing some little quizzes to establish what facts you already know. When you get to the point where you start missing (or getting them slowly), then you start doing lessons. William is excelling with the program, and is working on it most every day, for a few minutes at a time. He enjoys it, and loves seeing his chart fill up. Thomas is doing great as well. I have him in there daily for sure, doing at least a few minutes. He's trucking right along, and finds it enjoyable to do. He likes earning game time, but is also motivated by the chart filling up. Richard... wow, Richard is doing fantastic with this. I wasn't totally convinced that I was even going to have him try, but since I can adjust the amount of time the kids get (the minimum is 2 seconds, I gave everyone at least a bit more time than that as we are working on notebooks without a number pad), I moved him up to 9 seconds, and he is doing fantastic. He loves getting to the arcade time, and he truly loves working on it when Dad is watching. The other aspect of this is that working on the lesson will earn you time to play games, or to change your "guy" -- but you only get 5 minutes. I love that. And the cost isn't bad either. $50 for a year subscription, which is good for up to four kids. Seeing as I have four kids who can use this, that's $12.50 per child, or just barely over $1 per month per child. You can go see some screen shots, and try a demo lesson or two here. I am very tempted to purchase a subscription for my family when my 90 day subscription ends. Disclaimer: As part of the TOS Homeschool Review Crew, I did receive a complimentary 90 day subscription to Facts First from Saxon Publishing. The fact that I received a complimentary product does not guarantee a favorable review. It does guarantee a review. A fair review. But I am not going to praise something unless I think it deserves the praise. If I don't like it, you'll hear that. And hopefully with enough detail as to why so you can decide for yourself if what I hate about it makes it perfect for your family. For more about my take on reviews, visit my blog post here. I was even more excited about a bunch of information that Marie Rippel of All About Spelling provided us. Such as... there is going to be another book in the series soon, and they will be unveiling their new website -- www.all-about-reading.com -- this summer. And there will be four readers and a teacher's guide by the end of the year. 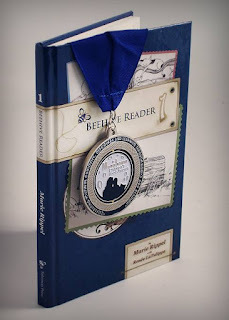 I adore the Beehive Reader, pictured here with its silver medal from Moonbeam Children's Book Awards. I can't say enough good things about it. The stories follow along with All About Spelling perfectly... starting about halfway through the AAS Level 1 steps. So your child has learned to spell the words used in the story. (There are a couple of "sight words" that have not been taught... "the" and "a" are the two I noticed.) Starting with Step 15 of All About Spelling 1, there is a chapter in the reader to go with every step in AAS (except Step 16), and an additional story to go with the final step. The book is just on such high quality paper. The binding is sturdy. And hardcover. It feels like "real book." No, it is a real book. The stories are actually fun... I can assign a child to read aloud to a younger sibling, and the younger sibling doesn't walk away in boredom. There are no fat cats. The sentences are not stilted. For the most part, they sound natural. For an older, struggling reader, the stories don't feel babyish. My kids understand a good story, they've heard enough of them. They don't like reading silly nonsense. 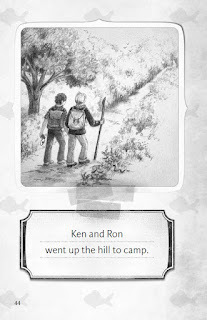 My 11 year old (who was 10 when we first bought the Beehive Reader) particularly liked the At Camp story (the third story in the book, one page pictured below). I love this reader. I want the next ones now. Negatives? Of course, there are some. At $19.95, this is a lot of money to spend for a child who picks up reading pretty easily and races through the beginning reading stages. For a struggling reader, I think it is worth every single penny (and I did pay for a copy). Even for a non-struggling reader (I'm thinking of Richard, my 5 year old, here) it is wonderful to have a "real" book though... not flimsy little paper books that have two or three words to a page. For my family, I have four children who have or will benefit from this book. And this is one I will keep (assuming it isn't permanently lost under a child's pillow) for my grandkids. I cannot say that with any certainty about any other beginning reader I've ever purchased. But that is $5 per kid for this book. While Connor did pick up Beehive Reader, and he enjoyed reading it (it's a lot more fun to read than The Iliad, his current school-book! ), I refuse to calculate any value in it for him! For a true beginning reader, you may want to start with something like the BOB Books. But the Beehive Reader is just so much nicer, I'd highly recommend taking a look. And did I mention that the illustrations are simply wonderful? Visit them, and check out more sample pages here. Disclaimer: As part of the TOS Homeschool Review Crew, I did receive this book for free from All About Spelling. The fact that I received a complimentary product does not guarantee a favorable review. It does guarantee a review. A fair review. But I am not going to praise something unless I think it deserves the praise. If I don't like it, you'll hear that. And hopefully with enough detail as to why so you can decide for yourself if what I hate about it makes it perfect for your family. For more about my take on reviews, visit my blog post here. So here is week 3 of what I've been reading! Inside the Revolution by Joel C. Rosenberg. I've been listening to this, on audio from the library. Wow. Don't even know how to begin to write about this one. I've read some of Joel Rosenberg's fiction titles -- The Last Jihad and others in that series. I enjoyed those, and thought the author seemed very knowledgeable about the Middle East. So the thought of getting more information about this area, from a Christian, was quite appealing. I'm wondering if I wouldn't have been better off reading this book though. I had a hard time keeping track of who is who as we went through the book, and I highly suspect I am going to need to listen again. On the other hand, hearing someone else pronounce all the names was a huge plus. The book is divided into three main sections: The Radicals (about people like bin Laden and Ahmadinejad, the segment of the Middle East that is out to destroy the West), The Reformers (about people like Karzai of Afghanistan and Talabani of Iraq, who are trying to stop the radicals from hijacking their peaceful religion), and Revivalists (who have become Christians, and are reaching out to evangalize their neighbors). The first section made it tough for me to sleep at night. The second and third sections gave me hope. I am woefully ignorant of the history and culture in the Middle East, particularly of the past 40 years, and maybe a second (or third) reading of this book will help me feel less uninformed. With my kids, I finished Adara by Beatrice Gormley. This was a really fun book to read. The premise is that Adara is the girl in 1 Kings 5 who was captured and became a slave in the household of Naaman, and who was then able to tell him that his leprosy could be cured by Elisha. We really enjoyed the story, and especially enjoyed reading from 1 Kings 4 and 5 to compare and contrast the events. Adara is pretty faithful to the Biblical events, and it did make most of us think. If you want to see what other people are reading, head over to the 52 Books in 52 Weeks blog to see other Week 3 book reviews. This is just a quick post to let you know that I'm going to be breaking some of my rules this week. I'm feeling a bit overwhelmed with reviews at the moment, so I'm going to make this last week of January a serious REVIEW WEEK. This will mean that I can go back to usually just posting one review each week, usually on Tuesday. And that makes me feel a lot less stressed. Week 3. The good, the bad, and the ugly. Okay, well, it wasn't as bad as last week, so maybe I should steal a different phrase. The good: my water intake is up. I am drinking water daily. Nowhere near what I should, but some. I actually "did" a workout. Okay, it was only Leslie Sansone, for one mile. More on that below. I also walked up and down my driveway a few times. Other than Wednesday, when my only exercise was trying to get into a position where I didn't feel like I'd throw up, I actually moved every day. The bad: Well, my water intake is nowhere near where it should be. One lousy glass of water, one would think I could actually do that. Yes, that is copied exactly from last week. Still true. The ugly: well, that would be a houseful of sick kids. That didn't add to my motivation to work out, or to drink my water. Sigh. So -- a quickie review of my workout of choice this week. Walk the Walk by Leslie Sansone. It includes a 1 mile workout (20ish minutes) and a 2 mile workout (35ish minutes). I did the 1 mile. And while the workout level was great for how I was feeling this week, and while I felt good doing something, and while I like the music (Christian music), there is something about hearing Leslie talk about picturing God putting on his little exercise shoes that just rubs me the wrong way. I seem to remember the 2 mile workout as being less, uhhh, aggravating. So that will be one of my workouts this week. My boys have all acted like they are allergic to pencils, so a writing program has been really difficult. One bit of advice I always hear is to teach them to type. So I have worked at that. We've used computer programs meant for kids, computer programs meant for adults, internet based typing games, internet based "no frills" types of programs... yet my guys still manage to type incredibly slowly, and not without having to look at least sometimes. At least they can more or less find the keys, but it is only a step above hunt and peck. 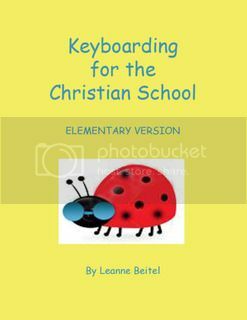 So, when I received two ebooks from Christian Keyboarding, I was initially hopeful, and then worried. The books look so BORING... and the initial lessons look like things I did in my high school typing class (which I detested). Yet, I did learn to type. And quite well, actually. Back in the day, I could sometimes manage to break 100 words per minute (though my usual average was more like 90). Wish I could still pull that off. I expected a total revolt. What I got? After about 8 minutes of work -- "That's all I have to do today? Hey, I like this!" Probing a bit, after a few days of lessons, what Connor is loving about this course is that the lessons have a clear goal. He knows exactly what he has to do in order to be "done" with his typing lesson. In all the computer based, and most of the internet-based, programs we have used before, you just keep doing the next thing, but there is no sense of completing something, really. No stopping point. After getting through the alphabetic keys (and basic punctuation), there are five lessons on the number & symbol keys. There are four lessons on using a number pad. And the next dozen or so lessons get into a lot of great concepts... centering, lists, tabs, and a bunch of stuff for writing reports and letters. This last part looks amazing. So, Connor has a new typing plan. He is going to work through Keyboarding for the Christian School, and then he can go back to using a computer program to work on building up his speed. But he will solidly know the keyboard first. I also started William (5th grade) and Thomas (3rd grade) with the Elementary version. This is similar in basic content... 20 lessons on alphabetic keys, 5 lessons on numbers and symbols, 4 lessons on the number pad, and then just a couple more lessons (centering, enumerated lists, timed writings). But the lessons themselves contain a bit more in explanation. And that adorable ladybug. Here is where I got totally different reactions. Thomas hated it. He's frustrated, he can't tell if he is doing what he is supposed to or not. He begged me to go back to a computerized typing program. After giving it a couple of days, I agreed. And the thing is, he is probably my best typist. The instant feedback and the typing games are a great fit for him. I don't know if he is just too young for this, or if it is totally a learning style thing. William, while he certainly doesn't love it, reacted a lot more like Connor. He likes knowing where 'the end' is. He still wants to go play little typing games, but he sees that he is learning from this without spending tons of time. William will continue to work through the Elementary book. When he completes it, we'll practice with a computer program. And in another year or two, he'll work through the regular version of the Christian Keyboarding program (maybe starting with the later lessons, maybe not). Thomas? Well, I've let him drop this. It's nice to have it available down the road, but for now, this isn't something I'm going to make him do. My opinions? I love the Bible verses. I love that this is fairly inexpensive. You can purchase both ebooks for $22 -- and through February 28, there is a coupon code for $5 off (NewYear5), making it an even better deal. The books are also available individually, and there are other products available also. 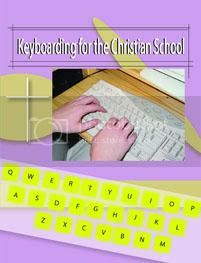 Disclaimer: As part of the TOS Homeschool Review Crew, I did receive two ebooks from Christian Keyboarding for free. The fact that I received a complimentary product does not guarantee a favorable review. It does guarantee a review. A fair review. But I am not going to praise something unless I think it deserves the praise. If I don't like it, you'll hear that. And hopefully with enough detail as to why so you can decide for yourself if what I hate about it makes it perfect for your family. For more about my take on reviews, visit my blog post here. I was scrapbooking with a group of teachers, primarily. They found out I homeschool, and asked a couple of questions. You know, how are you going to teach chemistry? (my oldest was only 9, maybe, at the time... my answer: I have no idea, but I'm pretty sure I have a few years yet to figure out which of the many resources out there will work for that), what about the prom? is it legal? and then... the question. But what about socialization? Oh! You mean their social lives? Yeah, well, that isn't a problem. They don't have to go to school to playact how to interact with people in the real world... they actually get to interact with real people every time we go out. We don't have to do social studies lessons to learn what a mail carrier does... my kids get packages from the mail lady and go to the post office for real. They've joined scouts and get to interact with people there, mostly in their own age groups, so they are even getting an idea as to what age-segregation is like. They don't have a socialization problem. I do. The TOS Crew Facebook Fan Page is sponsoring a question of the week every Tuesday. Socialization is planned for 1/26 and can be found here. I plan to participate as often as possible. Maybe this will even get me to join Facebook. 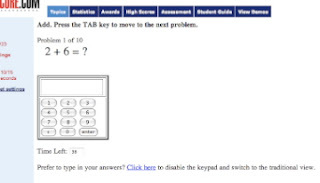 Math Score is an online math program, developed by MIT graduates, that advertises that it raises test scores. Okay, now test scores don't happen to be among my main homeschooling goals... but Math Score is more than that. Math Score includes topics ranging from 2nd grade through Algebra I, from things like knowing your addition facts, all the way up to applied linear equations. One thing that is a goal of mine is to have students who are fluent in math -- both in calculation and in understanding mathematical theory. Math Score is one way for my kids to get some practice in both of those aspects. There is a lot of content, and I believe this could be used as a stand-alone curriculum, though I am using it as a supplement. Math Score is a no-frills, internet-based program. Absolutely nothing needs to be installed, it works on both our macs and our PCs, and it is basically a lot of short math worksheets. You earn points for completing levels, and you have straightforward ways of seeing your progress. There is nothing fancy or flashy about this. At all. No little animations, no earning coins to spend somewhere. The fanciest thing about it is that there are some trophies you can earn, and you earn promotions based entirely on the number of points you have earned. That sounds pretty boring. But it isn't necessarily. The worksheets are short, which helps, and they adjust for how the student is doing. When I played with it, it quickly gave me the option to skip a few levels in "fast addition" and many other topics. So with only a couple of worksheets, I could earn all the points possible in addition, and move on to something else. While my 3rd grader works through them in a more methodical way, I wasn't stuck "learning" that 2+3=5... it realized I was doing great with addition and let me bypass those middle steps. Richard, age 5, is doing first to second grade math. He ended up very, very frustrated with the fact that this is timed, and he really needed something more to hold his attention. Given that I do have other things he can be doing right now instead (we've been blessed with a plethora of math programs!) I opted to drop this for him. If I wanted to make this work, I could have either greatly increased his time allotment, or I could have typed the answers in for him. But basically, he really wanted the external rewards -- earning game time, earning some cutesy little video, whatever. While he is capable of the math, this program does not hold his attention, and it takes too much from me to make it work for him at this time. Another year or two, I think it will be much better for him. William, age 11, is in fifth grade. He doesn't beg to do Math Score, but he does work on it willingly when it is assigned to him. He likes seeing his scores go up, and he likes making the next rank. He's mostly been working on math facts so far, but I think I need to encourage him to try some of the other math concepts at his grade level. Working on the exercises involving rounding (shown below), changing decimals to fractions, types of triangles, etc. will be something he finds more motivating. If I can get him to do 1-2 worksheets a day of the math facts, then work on more "fun" topics, I think this will work out better. I'll keep you posted on that. Connor is currently doing Algebra 2 and Geometry in his "real" math school life. He is loving Math Score. The no frills aspect doesn't bother him in the least, as he doesn't really bother with designing his own avatar and all that kind of thing on the other sites anyway. He is able to go in and just do math. 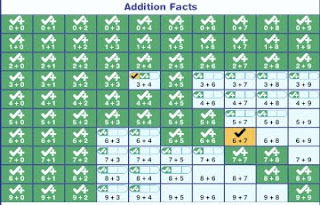 On the most recent report I got, he had worked on the following topics: Copy Cat; Fast Addition (he is bored with both of these, so he's been doing a worksheet per day, he's at 90 now); Least Common Multiple; Greatest Common Factor; Prime Factoring (shown below); Exponent Basics; Probability; and Quadrilateral Types. Overall, I think this is one of those programs that is well worth a try, for probably third grade and up. They do have a free trial offer, so you can get a feel for how the program works. Their pricing structure is a bit complicated, but right now, the first child is $9.95 per month (price going back to the regular $14.95 after two months), a second child is $5, and additional children are $3.95. You can prepay, and payments of $50 or more give you a bonus. Like I said, it is a bit complicated to explain. Just try it out. See what you think, and give it a few days. This is one program that (except for Richard) we all liked a lot more after a week than we did after a day, and after a month, we like it even more. Disclaimer: As part of the TOS Homeschool Review Crew, I did receive a free subscription to MathScore. The fact that I received a complimentary product does not guarantee a favorable review. It does guarantee a review. A fair review. But I am not going to praise something unless I think it deserves the praise. If I don't like it, you'll hear that. And hopefully with enough detail as to why so you can decide for yourself if what I hate about it makes it perfect for your family. For more about my take on reviews, visit my blog post here.